Hey Cricut friends! It’s Cori, back from Hey, Let’s Make Stuff. Are you almost ready for Valentine’s Day? It’s right around the corner and I have a quick project for you to make to get your little one ready! 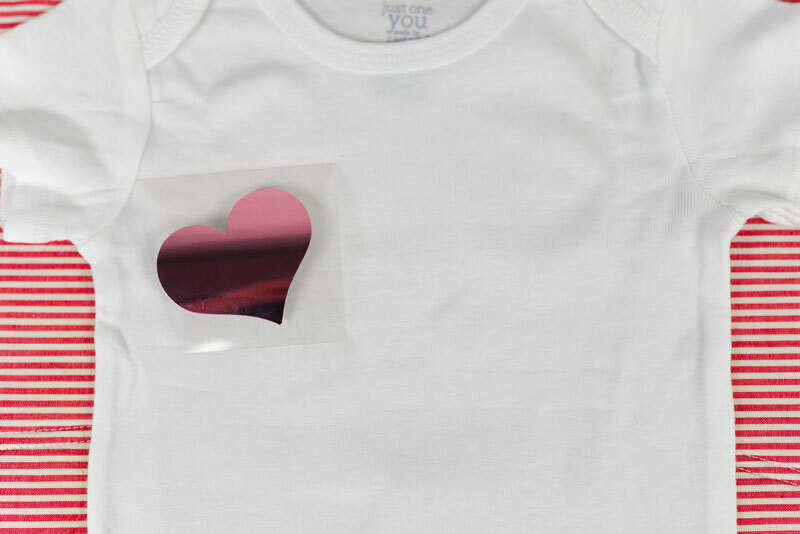 Today we’re making these cute Valentine’s Day onesies using pink iron-on vinyl and pink iron-on foil. 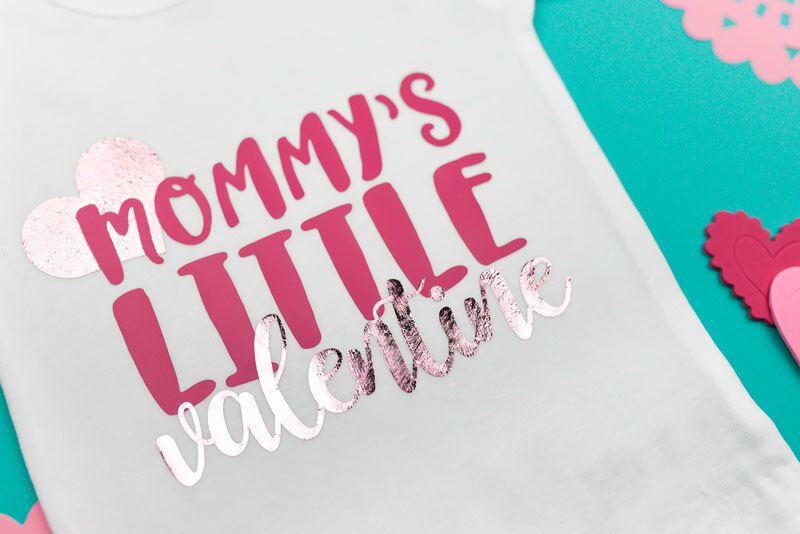 These onesies are perfect for baby’s first Valentine’s Day but also work on a t-shirt for your favorite toddler. So cute! We’ll also be taking a look at how to layer iron-on vinyl using the Cricut EasyPress. The EasyPress makes layering vinyl so easy, as you’ll see. 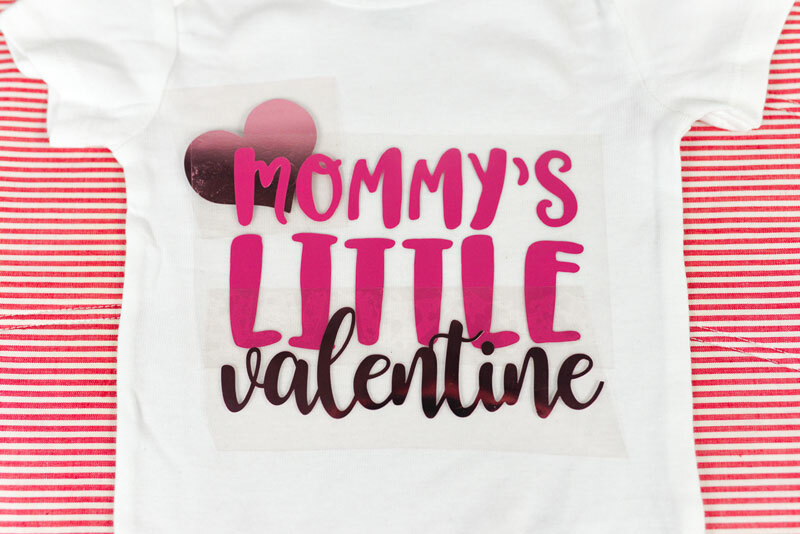 First, download the Little Valentine file by clicking the link, right click to save, and upload it to Cricut Design Space. I suggest making one at a time, so hide the image you don’t want to make. 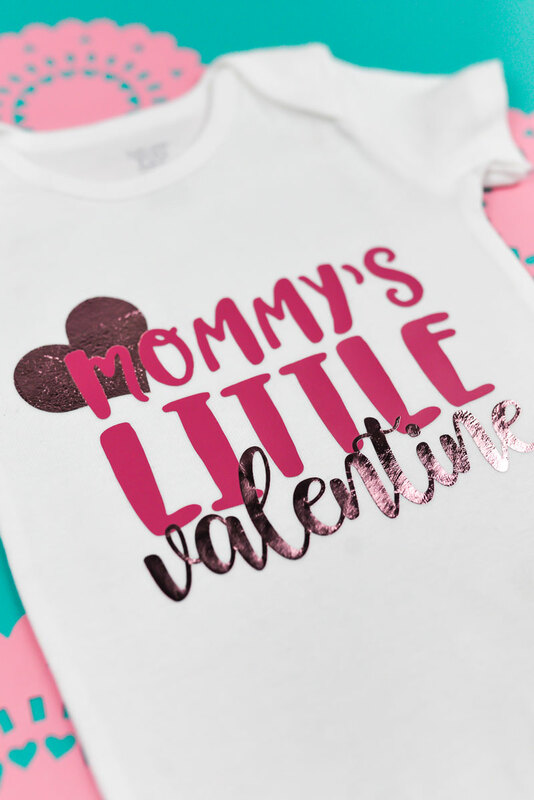 To cut this file in the correct size for your child’s onesie or t-shirt, Use Cricut Templates, which I explained in detail here. I am using the 6-month onesie template (found under “pajamas”) to make sure my sizing is correct. Note that the template will not cut—it’s just a guideline to help you size your image. When you go to cut your iron-on vinyl and foil, make sure to mirror your image and place your material shiny side down on your cutting mat. Cut out your image. Weed the negative space, and then using scissors, cut between the heart and the word “valentine” so they are separate. Layering vinyl using the EasyPress is much easier than using a traditional iron. The even heating of the EasyPress means you don’t get hotspots—which I have found are a big pain when layering iron-on vinyl – melty, uneven vinyl is no fun for anyone! Thankfully the EasyPress doesn’t have hotspots, so you know that your iron-on vinyl will be heated evenly and your project will turn out perfectly. Start by placing all three iron-on pieces on your onesie to make sure everything is placed right, with your heart on the bottom layer. Then take away the two other sheets, leaving just the heart in the right place. 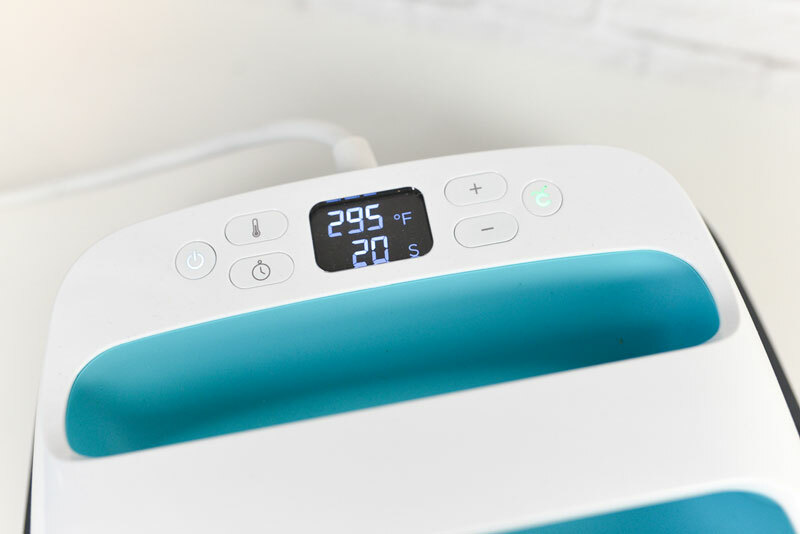 Heat up your EasyPress to the suggested temperature for your material. In my case, the onesie is cotton and I’m using iron-on foil, so my temperature is 295°. Normally, I’d set my EasyPress for 35 seconds, but because we’re doing several layers, I’m going to just set it to 20 seconds for the first two layers. You can put the EasyPress directly on the iron-on, but I prefer to use a pressing sheet or a piece of cotton fabric. Place your EasyPress over the heart and apply even pressure and push the green button. When it beeps after 20 seconds, return the EasyPress to its base. Cricut iron-on foil is “cold peel” so you have to wait for the material to cool before peeling the backing piece off. Then put your “Mommy’s Little” or “Daddy’s Little” piece next. I didn’t increase my temperature to 305°, which would be the normal iron-on lite setting. I didn’t want to damage my foil. 295° is enough to set the iron-on lite so we’ll stick with that. Repeat the 20-second press for this layer, and peel off the transfer sheet. Cricut iron-on vinyl is “hot peel” so you don’t have to wait for this layer to cool before removing the backing piece. For the final layer, increase your time to 30 seconds. This will make sure that all three layers are completely set. After this press, turn your onesie inside out and press for 30 seconds from the back as well. This will help adhere the iron-on even better. Note: If you’re using glitter iron-on, it needs to be the top layer of your project. Because the glitter isn’t flat, it doesn’t work well as a base for other layers. Layering iron-on doesn’t have to be scary! Just make sure you’re using the lowest heat setting for your materials and taking your time to place your layers exactly where you want them. 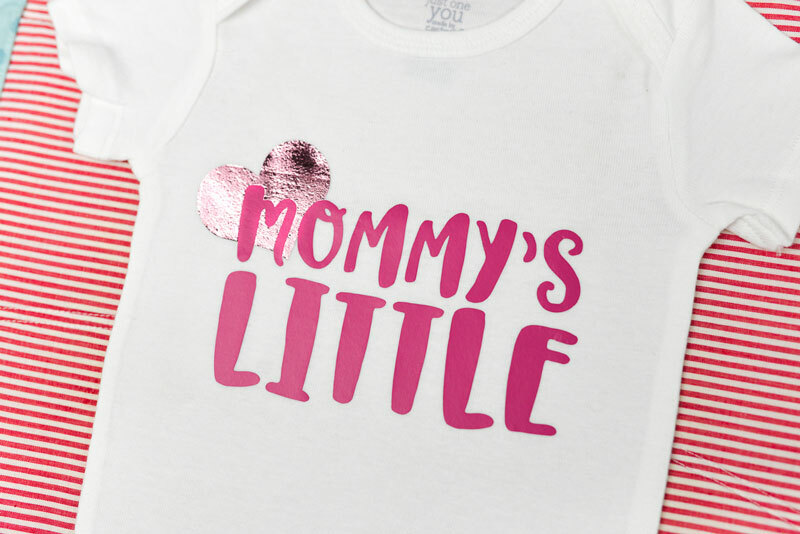 It makes creating cute custom clothes, like this onesie, super easy! Do you have any fun Valentine’s Day projects you’re working on this year? I’d love to see them in the comments!